1. Prepare springform pan by spraying with cooking spray and then lining with plastic wrap. Let plastic wrap hang over the sides of the pan. 2. Thaw 6 cups frozen raspberries. Remove ice cream from freezer and soften. 3. Stand ladyfingers, cut in length to be flush with top edge of pan, rounded edge at the top, along the sides of the plastic lined pan. Place additional ladyfingers in the bottom of the pan, to cover. Go ahead and squeeze these in tightly to cover bottom of pan, cut them to fit in the small areas. 5. Puree raspberries in a food processor with the sugar. Press through a fine sieve into a large bowl. 7. Pour ice cream mix into prepared pan with ladyfingers. 8. Freeze cake, covered with plastic wrap, until frozen hard, about 6 hours or up to 1 week. 9. Remove cake from freezer and let soften in refrigerator at least 30 minutes and up to 45 minutes before serving. Remove cake from pan discarding plastic wrap. 10. Whip heavy cream with sugar and almond extract until stiff peaks form. 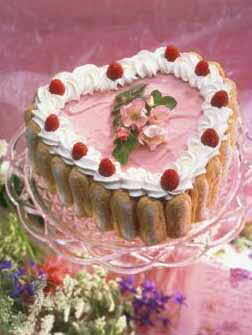 Garnish cake by piping cream along edge of cake with a large piping tip. Top cream with fresh or frozen whole raspberries. You may further decorate center with unsprayed fresh flowers, if desired. 11. Serve cake with sauce. Pass extra sauce at the table. 12. To prepare sauce: In a food processor, puree raspberries with sugar and Amaretto (or almond extract) and force through a fine sieve into a bowl. Sauce may be made ahead, covered and chilled. Makes 1½ cups.